Why is it important to be aware of my breast cancer related lymphedema risk? How do I manage lymphedema? How do LympheDIVAs garments help me manage my lymphedema (or lymphedema risk)? When should I wear a compression sleeve? When a sentinel node is removed, a number of nodes are removed, or if the nodes receive radiation therapy, the body is at risk for lymphedema. The loss of lymph nodes and vessels can result in lymphedema in the arm or other parts of the body. The amount of fluid collection is variable and at this time, unpredictable because of the variability of the insults and the lymphatic system itself. 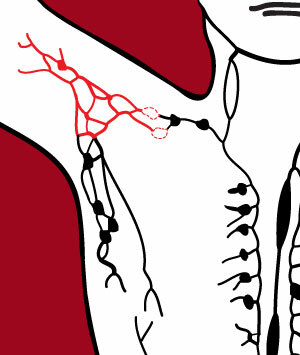 Any event which stimulates the formation of increased protein fluid and floating cells between the cells in the arm (such as infection, trauma and sun burn) or slow the flow of lymph fluid out of the arm (such as have blood pressure taken with a cuff) can increase the chance of fluid accumulating in the arm. Since no truly curative therapies exist, medical intervention is focused on preventing occurrences and recurrences and is most often dependent on patient self management and adherence. Prolonged or severe fluid build up can result in a more severe and permanent lymphedema. Lymphedema is managed and treated through a variety of therapies. Compression arm sleeves and gauntlets are one such therapy. LympheDUDEs arm sleeves and gauntlets are Class 1 (20-30mmHg) and Class 2 (30-40mmHg) medical devices. Like other arm sleeves they utilize graduated compression, the highest pressure is at the wrist and acts as a pump to encourage the lymph vessels to push the lymph fluid toward the body. LympheDUDEs garments are regularly tested using a Vista-Medical FSA pressure mapping system to assure proper compression. LympheDUDEs garments can improve patient compliance to therapy through increased comfort and better fashion. At LympheDUDEs we believe that a majority of sleeves that were prescribed and purchased were worn a few times and then hidden in a drawer out of distaste and discomfort. Knowing that the compression sleeve cannot reduce the chance of occurrence or swelling by remaining in the drawer, LympheDUDEs has made lymphedema management easier by adding a dose of style and having superior comfort. A LympheDUDE enjoys wearing his sleeve because it is stylish, modern and fun. Men are more likely to derive the benefits of the garments simply because they are more likely to wear them and less likely to suffer from complications! We recommend consulting with a doctor or lymphedema therapist in order to find the most appropriate therapy for each individual. All women who are at risk for lymphedema or who have mild to moderate lymphedema should, at a minimum, wear their sleeve and gauntlet during air travel and while exercising.